Venue phone: 0351 – 8 567 144. Address: Andreas Gayk Str. 31. Venue phone: +49 40 35766666. Khovalyg is a very talented autodidact singer. 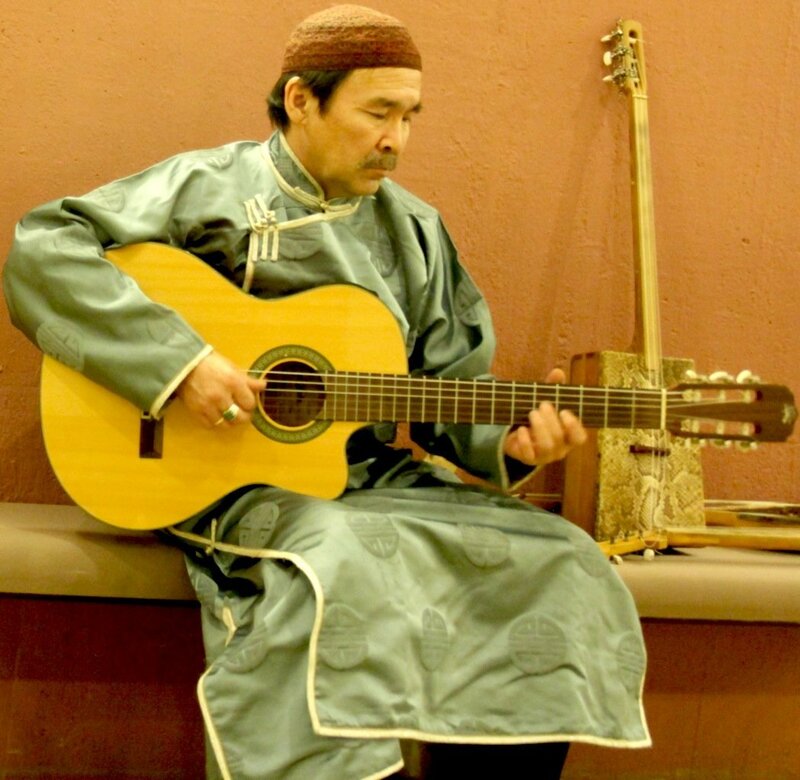 He worked as a shepherd, until he was invited to the Tuvan State Ensemble. Then he moved to Kyzyl. 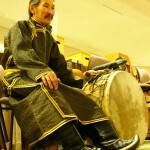 Kaigal-ool is one of the founders of the ensemble “Huun-Huur-Tu”. In 1993 he left the Tuvan State Ensemble to devote himself to newly created quartet. Khovalyg primarily known for he’s unique vocal styles khoomei, kargyraa and playing igil – traditional Tuvan instrument. Radik studied throat singing and playing traditional instruments from his grandfather. Every summer he went to his grandparents in distant taiga camp. 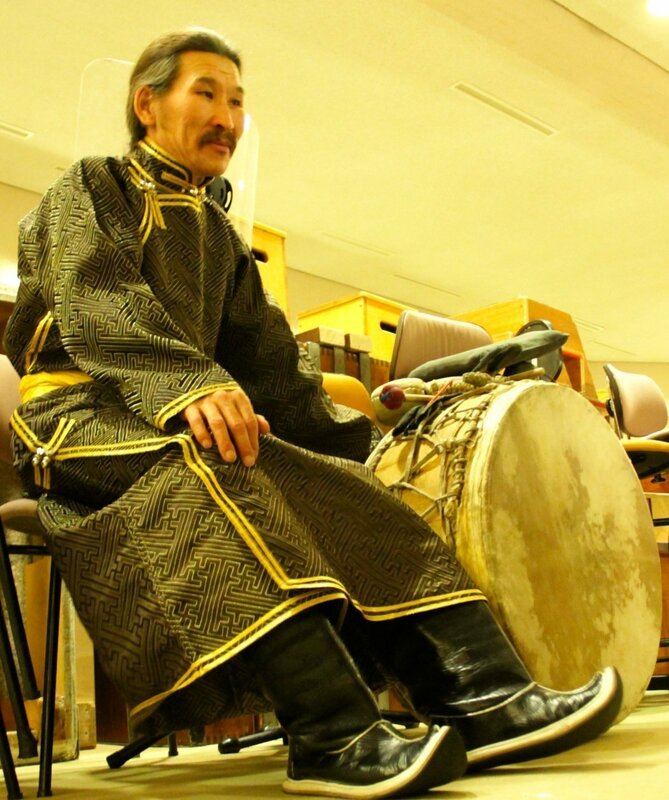 Listening to throat singing of his uncle and grandfather Radik learned words and melodies of ancient Tuvan songs. He is a graduate of the School of Arts in Kyzyl (Department of Tuvan National Instruments), and the East-Siberian State Academy of Culture and Arts. From the school years till now he plays in the Tuvan rock band “YER”, which released four albums. 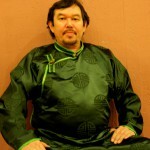 In 1999-2000 he worked in the folk collective “Tuva”, then in the band “Yat-Kha» (www.yat-kha.com). 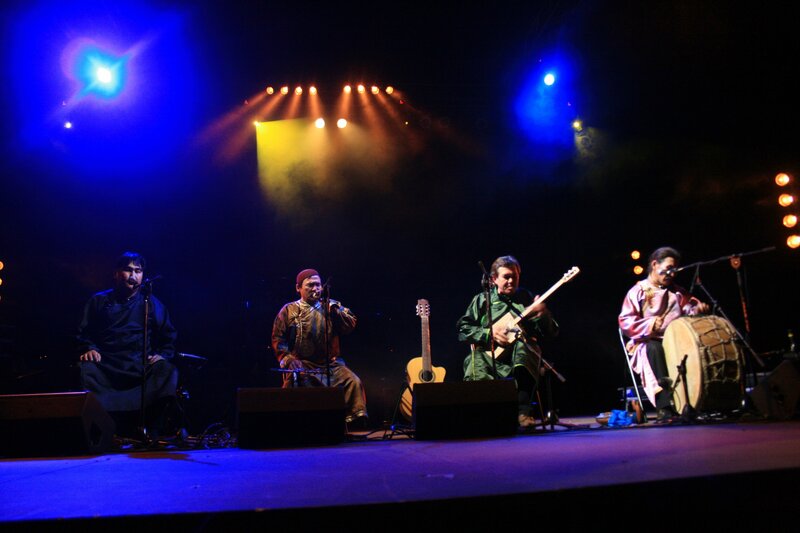 During this time “Yat-Kha” released 2 CDs and won the BBC Radio Award-3 «Awards for World Music ». In 2003 Radik also joined in Tyvan National Orchestra as a musician, where he was the director of the group for some time. 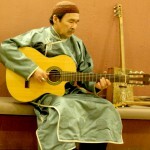 In 2005, in England, together with ethnomusicologist Carole Pegg from Cambridge University, Radik Tyulyush released the first solo album «Tuva: Spirits of my Land» (www.innerasianmusic.com). He was invited to “Huun-Huur-Tu” in 2006. His father is Tuvan and mother – Russian. Sayan grew up in industrial town Ak-Dovurak. He studied music in Kislovodsk: he was playing bass guitar in Russian jazz-rock bands during several years. In the early 90s Bapa returned through Tuva to his musical roots. Here he became a member of a folk-rock band which played traditional tuvan music on modern instruments. He is also one of the founders of the ensemble “Huun-Huur-Tu”. Sayan Bapa is a versatile instrumentalist. He plays doshpuluur, igil, acoustic guitar. As a vocalist, he specializes on style kargyraa. Alexey Saryglar joined the ensemble in 1995, replacing Alexander Bapa. 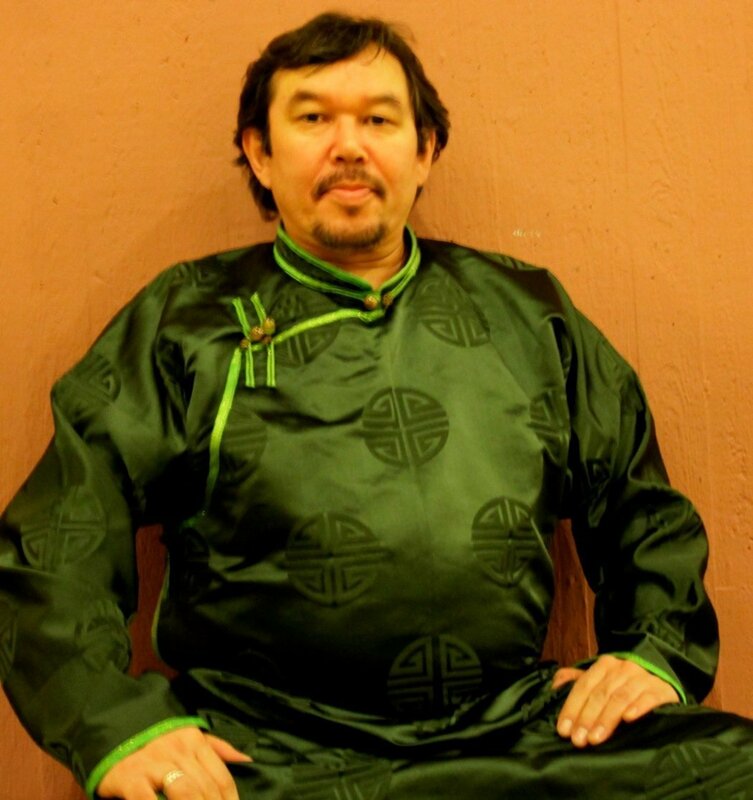 He received his musical education in Ulan-Ude in percussion class and was a member of ensemble “Siberian Souvenir.” Alexey is a talented sygyt musician, an expert of traditional Tuvan percussion and stringed instruments, and also a piano player. He lives in Kyzyl, like other members of “Huun-Huur-Tu”. Question: When did you start to try “crossover” projects? Why? Huun-Huur-Tu: We started crossover projects from the very beginning of our international career. Our regular tours started in the USA in 1993. 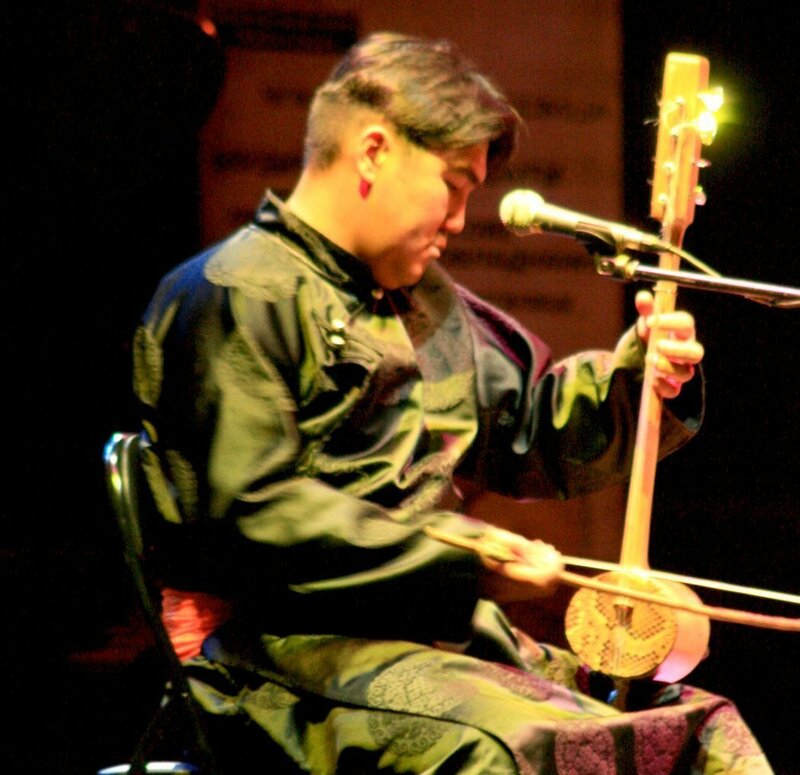 1992-1993 were years of real explosion of the wide interest to Tuvan music. Our US “breakthrough” happened with significant help of known US musicians, with whom we made joint recordings in 1992-1993. It was Frank Zappa, who invited us to his home studio in Studio City and made recordings of our music with participation of Frank himself on guitar, Johnny “Guitar” Watson, L.Shankar, and Chieftains. It was an incredible cross-cultural experience. Because of Frank´s death this material has been never released…Another joint project was work with Ry Cooder for “Geronimo” movie soundtrack. Doing this work, we were surprised – how close is Tuvan culture to the culture of native Americans, so both we and American Indians started to believe that their predecessors migrated to American continent from Siberia. We also made several recordings with Kronos Quartet (later released in 2 CDs – “Night Prayers” and “Early Music”), and Mickey Hart – the drummer of Grateful Dead. Why we did all this in 1992-1993? First of all, all these American musicians, representing very different music directions, were eager to do something together with us. It was their initiative. We were proud to collaborate with them, we also were proud to be true “ambassadors” of unique Tuvan music. Each folk music, instrument and music genre has different roots and its way to perform. How do you connect your music or yourself with the music or musicians from other cultures? You always collaborate with different musicians all over the world; do you think this kind of crossover projects brings your music something new? And how? Huun-Huur-Tu: We do not thing that crossover projects really change our own music. But in these very projects our music definitely finds new ways, new colors – especially when some magic connection happens, and then it becomes more than just a sum of 2, 3 or 4 ethnic cultures, it becomes really new music. What’s the key point of making a link between your music and other music / tradition and creation? Huun-Huur-Tu: This questions relates to previous one. The key point is to exceed the level of just a “sum” of several cultures. The key point is to create a new quality, new music as a result of collaboration – when particular ethnic elements not just “co-exist” with each others, but “speak” to each other and find a way to create a perfect unity. Huun-Huur-Tu: Yes, mechanical “cultural mix” might lead to artificial, boring results. But you mention very important names for us – our project with Ross Daly and his Greek musicians and Chanirani Trio from Iran, as well as the joint project with Bulgarian Voices Angelite and Moscow Art Trio are perfect examples of our most successful collaborations, when the initiators and music leaders of collaborations (Ross Daly and Misha Alperin respectively) have managed to create real unity and harmony between all participants. As a result – in both cases joint music is far more than jut a “blend” of ethnic components, it´s rather self-sufficient new music, when different ethnic elements work for the common idea and enrich each other.